Izabelle Doucet and a dolphin friend. My soul was hurting. I had just lost my companion of seven years, a red toy poodle, Sammie, whom my daughter had given me. We had become inseparable. Additionally, I was coming out of a 26-year marriage and feeling lonely. Frankly, that particular day, I was inconsolable and wondering if I would ever get over it. At that moment, I picked up the pieces of my life and let the sunshine fill my existence again. Soon, a man entered my world and I moved in with him. We were living by the sea in a condominium complex where dogs were not allowed, but the truth be I was pretty happy with my life. One day my back gave out. The pain was excruciating. I was forced to lie in bed for a week. My gentle man was bringing me breakfast and the newspaper. One morning, I opened it right to the “animals for sale” section. “What a coincidence,” the breeder said. The word ” coincidence” reverberated and was immediately replaced by “synchronicity” in my head. “I have grey females only so often,” the breeder continued, “but I happen to have a beautiful little one ready for adoption.” Somewhat embarrassed, I repeated “Yes, but I can’t have any animals where I live. My companion, who had overheard this, told me after the call, “Get your little pooch if you want it. We will keep it inside and if it becomes an issue, we can move.” I was delighted, but not convinced, it was such a good idea.I really did not want to cause a problem. Yet, I would not let go of the idea. 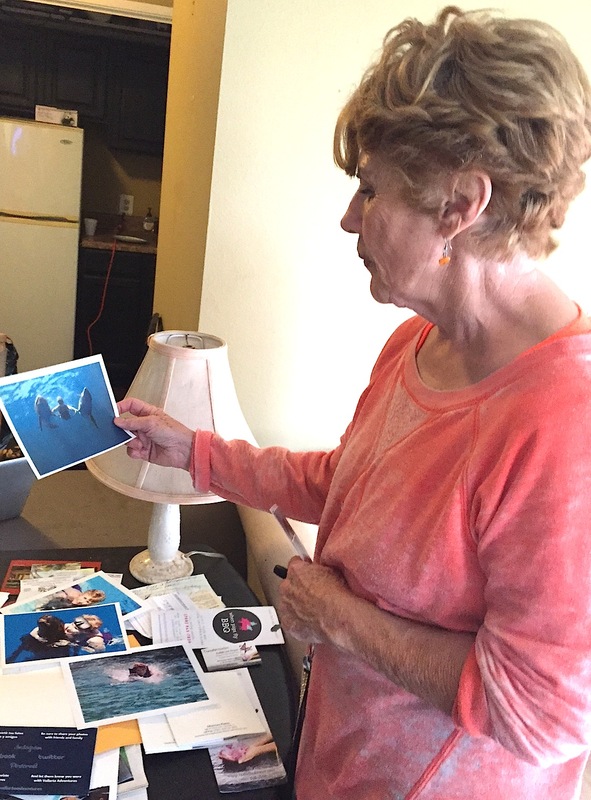 Izabelle Doucet looks at a photo from her dolphin adventures in Mexico. My daughter stopped by the following Saturday and told me that she wanted to take me for a ride. Informed of everything that had been going on, she suspected the breeder was the same one who sold her Sammie in the first place, because of where the breeder was located. We decided to drive all the way out and pay a visit to that breeder. OMG! About two dozen bundles of joy were jumping up and down in that lady’s house. I was overwhelmed! Could it be that Sammie had returned and was among these? The body knows. From conception, babies in the womb obtain the nutrients they need from their mother, in the exact quantity they need. This inner intelligence never goes away. We just do not trust and use it with the exception of people who live on, and off, the land that are in tune with their knowing and heal themselves with Mother Nature. Kinesiology acknowledges the validity of the body’s intelligence. So, my daughter held the li’l pup on her solar plexus and I proceeded with the question: “Is this being the reincarnation of our former Sammie?” My daughter’s arm became stronger than before. My jaw dropped, and the breeder’s daughter came in. I seized the opportunity to test somebody who had no skin in the game. I asked and she agreed. Her arm became rigid. My daughter and I got excited. I paid without any attempt to negotiate the price down, and my daughter carried this baby out. I sat first in the passenger seat as the doggie was deposited on my lap. Right away, she jumped on my right shoulder and curled up in my neck as Sammie used to do!. ” THAT IS HER!” we both exclaimed at the same time. I was beyond excited. On the way back, I urged my daughter to make a stop so I could use the restroom. When I returned and sat back on my seat, Sammie jumped off my daughter’s arms and started licking me all over. She was no doubt the same doggie. She had come back. My daughter and I were looking at one another, marveled by the confirmation. A year-and-a -half later my ex-husband called to let me know he was on his way to get our other dog euthanized. Winston, a regal standard poodle, the bearer of a champion pedigree, had gotten blind and old. He had been a loyal friend to both of us but, sadly, for his own good, it was time to say good-bye. In gratitude, I sent light Winston’s way and let him know that I was planning on Sammie #2) having a litter. If he chose to, he could come back with me. Yet, I needed a sign from him. Once pregnant, the vet estimated that Sammie would go into labor between Aug. 15 and Aug. 18. I was still sleeping in the early morning of Aug. 10 when my friend urged me to come in the kitchen where Sammie was in the process of giving birth. Barely awake I asked, what is today’s date? Tenth of August, he answered. I jumped out of bed. The labor was premature, or so I believed, and the babies might not make it. Then, I repeated, incredulous, “OMG! Tenth of August??? This was Winston’s previous birth date. Sammie gave birth to six adorable puppies, a white, a champagne and a dark pairs, all vigorous and healthy except a little white one. The largest one was white and exhibited leadership qualities from the get go. This was the one, I felt. I called on my daughter to see which one of the six she felt was Winston and she picked the very same one. One week later, the sickly twin expired. Winston remained the only white one. HE WAS THE ONE. if you do not believe in reincarnation, it is OK, but the question is futile. If you do, the next question is “Why not animals?” After all, everything in the Universe is energy. In physics, the law of energy conservation states that energy can be neither created nor destroyed. Energy remains constant yet does convert. So, if your heart breaks over the loss of a furry companion, instead of swearing that you will never have another pet because their departure is too painful, ask your furry friend to please come back. It will find you, promised. They always come back.